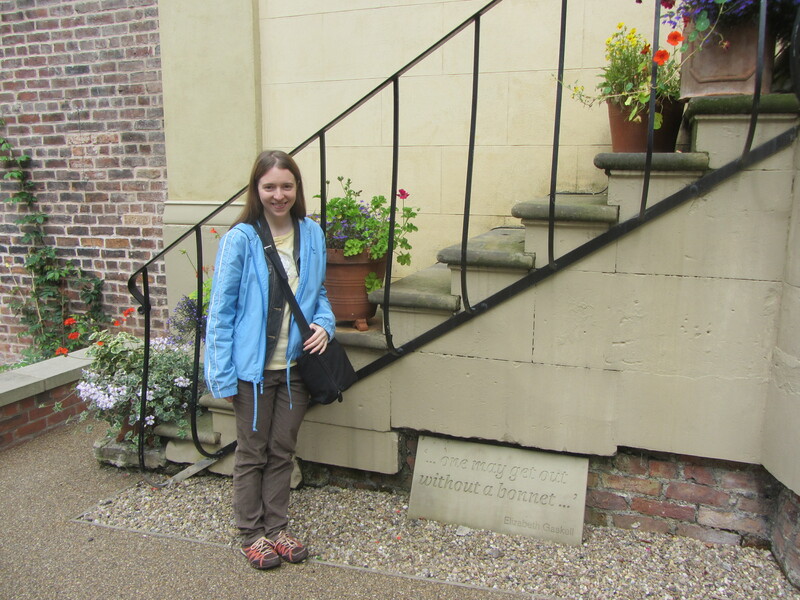 Over the August bank holiday weekend, my husband and I went to Manchester for the first time. Big cities aren’t our usual vacation destinations of choice, but we were going for the Sufjan Stevens gig at the O2 Apollo on the 31st and wanted to do the city justice while we were there, so stayed two nights at a chain hotel and worked out everything we wanted to see and do there, including two literary pilgrimages for me: Elizabeth Gaskell’s House and Chetham’s Library, where Karl Marx and Friedrich Engels met and discussed ideas in the summer of 1845. Armed only with a two-page map sliced out of an eleven-year-old Rough Guide, we felt perhaps a little ill-equipped, but managed to have a nice time nonetheless. 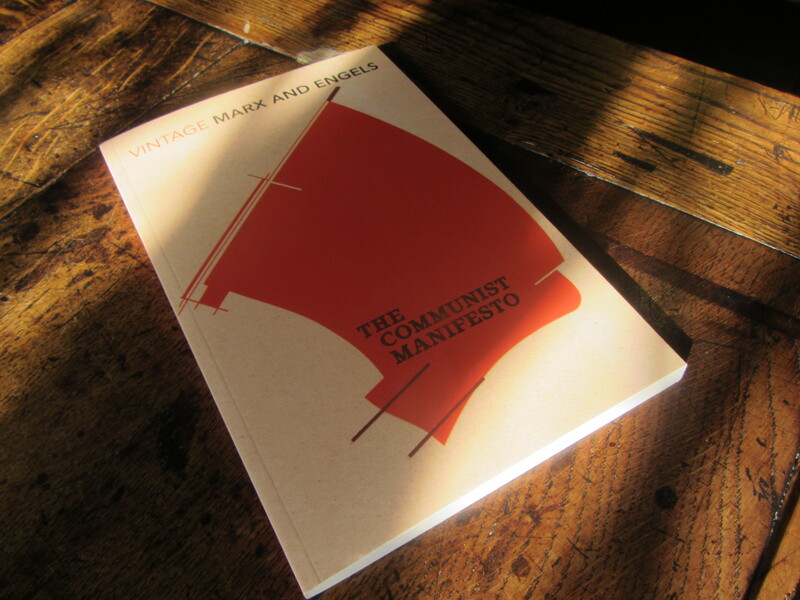 In preparation, I read The Communist Manifesto on the train ride north. It’s only 50 pages, and even with an introduction and multiple prefaces my Vintage Classics copy only comes to 70-some pages. That’s not to say it’s an easy read. I’ve never been politically or economically minded, so I struggled to follow the thread of the argument at times. Mostly what I appreciated was the language. In fact, it had never occurred to me that this was first issued in Marx’s native German; like Darwin’s Origin of Species, another seminal Victorian text, it has so many familiar lines and wonderful metaphors that have entered into common discourse that I simply assumed it was composed in English. 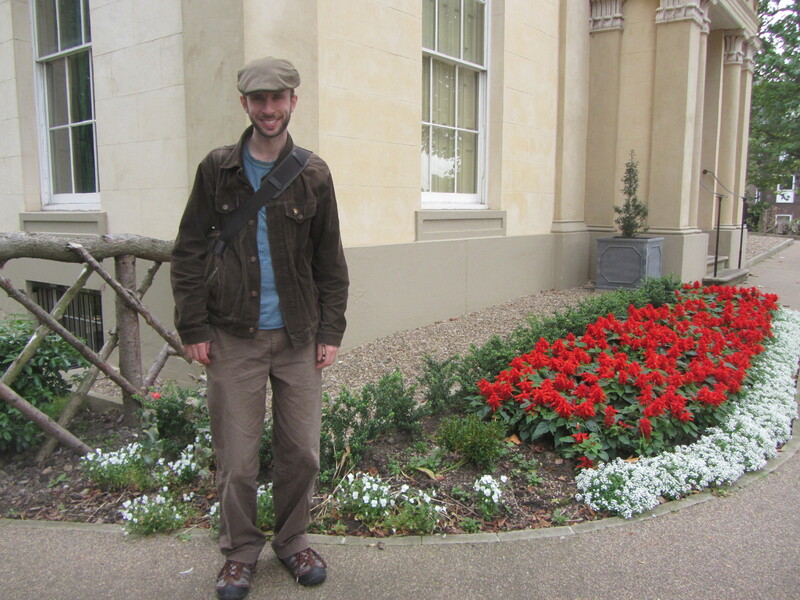 After leaving our bags at the hotel on Sunday afternoon, we wandered over to the Gaskell House. It’s only open a few days a week, so we were lucky to be around during its opening hours. All of the house’s contents were sold at auction early in the twentieth century, so none of the furnishings are original, but the current contents have been painstakingly chosen to suggest what the house would have looked like at the time Gaskell and her family – a Unitarian minister husband and their four daughters – lived there. 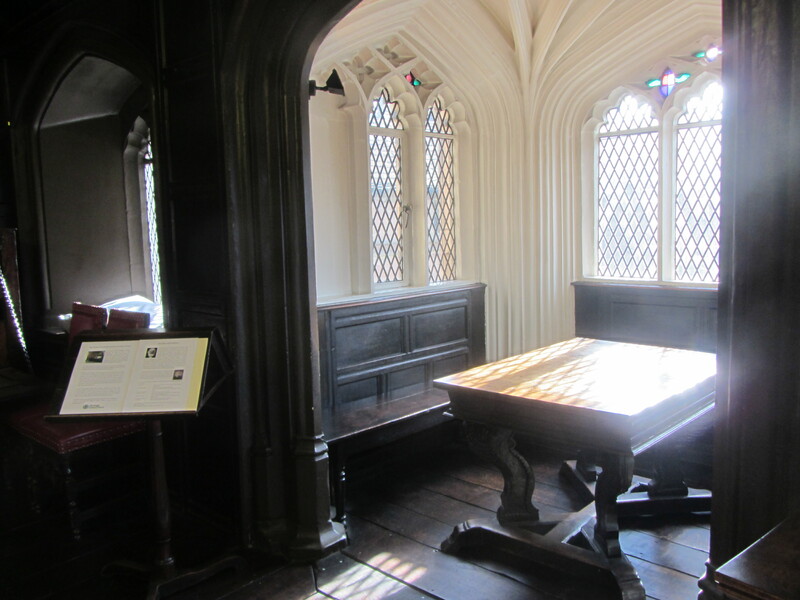 I especially enjoyed seeing William’s study and hearing how Charlotte Brontë hid behind the curtains in the drawing room so she wouldn’t have to socialize with the Gaskells’ visitors. 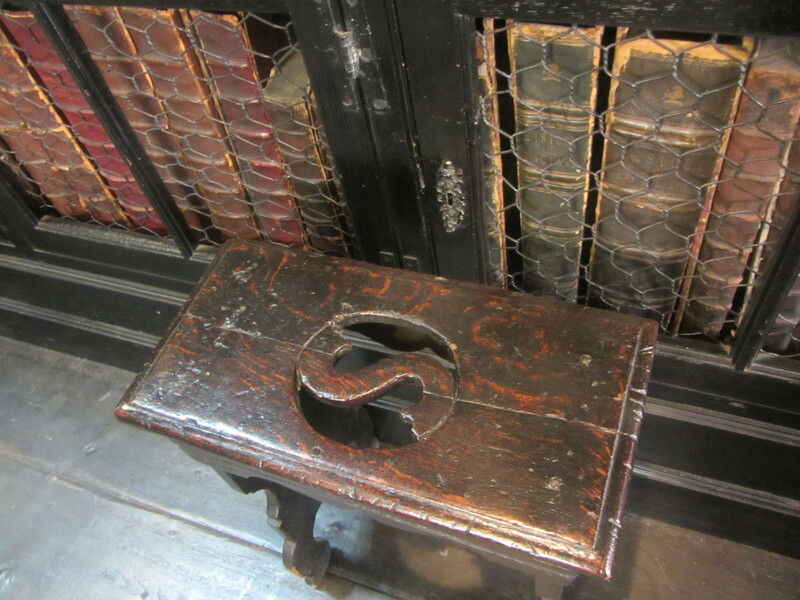 The staff are knowledgeable and unfussy; unlike in your average National Trust house, they let you sit on the furniture and touch the objects. The gardens are also beautifully landscaped. 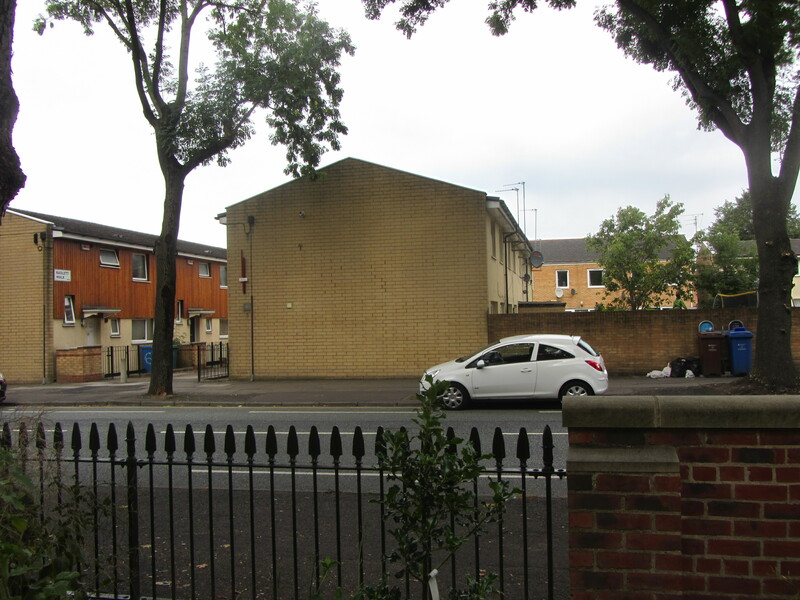 Talk about a contrast, though: look across the street and you see council housing and rubbish piled up on the pavement. In Gaskell’s time this was probably a genteel suburb, but now it’s an easy walk from the city center and in a considerably down-at-heel area. Indeed, we were taken aback by how grimy parts of Manchester were, and by how many homeless we encountered. 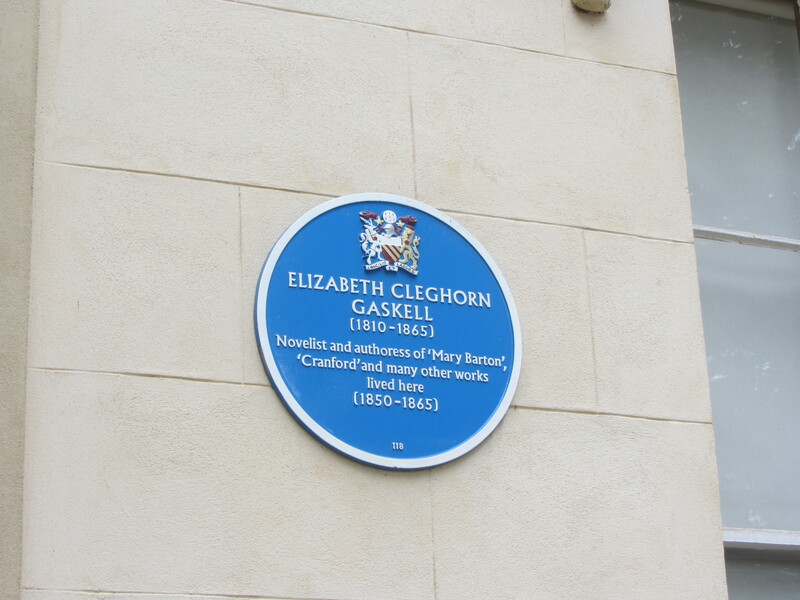 I’ve read four of Gaskell’s books: Mary Barton, North and South, Cranford and The Life of Charlotte Brontë. She’s not one of my favorite Victorian novelists, but I enjoyed each of those and intend to – someday – read Sylvia’s Lovers and Wives and Daughters, which was a few pages from completion when Gaskell died of a sudden heart attack in their second home in Hampshire, aged 55, in 1865. Afterwards we stopped into the city’s Art Gallery and then headed to Mr Thomas’s Chop House for roast lamb and corned beef hash, then on to Sugar Junction to meet a blogger friend, the fabulous Lucy (aka Literary Relish), who I’d been corresponding with online for about two years but never met in real life. She graciously treated us to drinks and dessert at this cute café (one of the city’s many hip eateries) where she often hosts the Manchester Book Club, and we chatted about books and travel spots for a pleasant hour and a half. 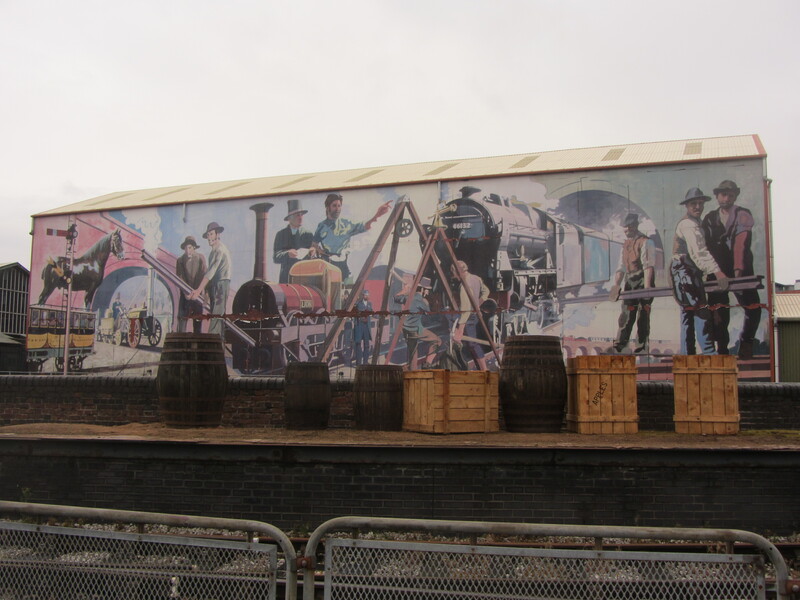 On Monday we explored the Castlefield area with its canals and Roman ruins and went round both the Museum of Science and Industry and the People’s Museum, which together give a powerful sense of the city’s industrial and revolutionary past. 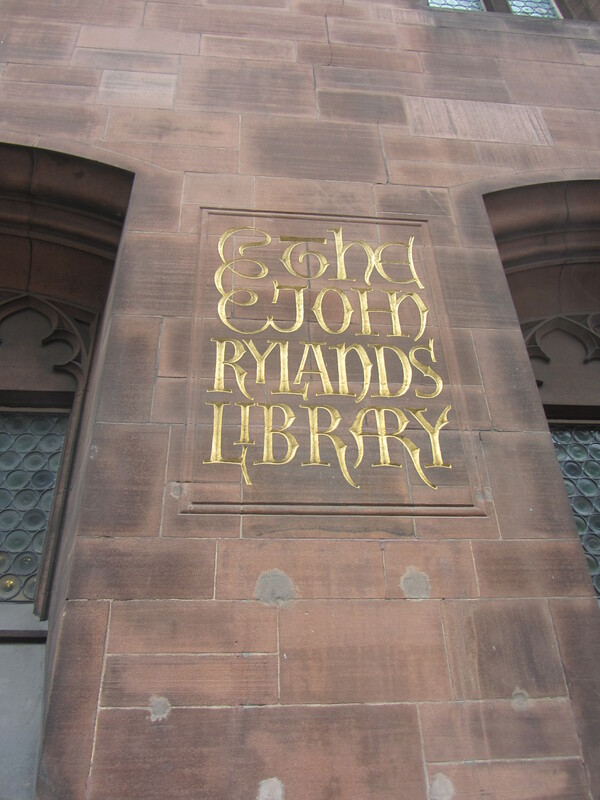 We also toured the cathedral, took a peek at a Special Collections exhibit on the Gothic plus the main reading room at John Rylands Library, and browsed the huge selection at the main Waterstones branch. (On a future visit we are reliably informed that we must go find Sharston Books, a warehouse-scale secondhand shop out of town.) After a necessary pit stop for caffeine at The Foundation Coffee House and the best pizza we’ve ever had in the UK at Slice (including a Nutella and banana calzone for pudding), we headed over to the gig, which was terrific but not the purpose of this blog post. 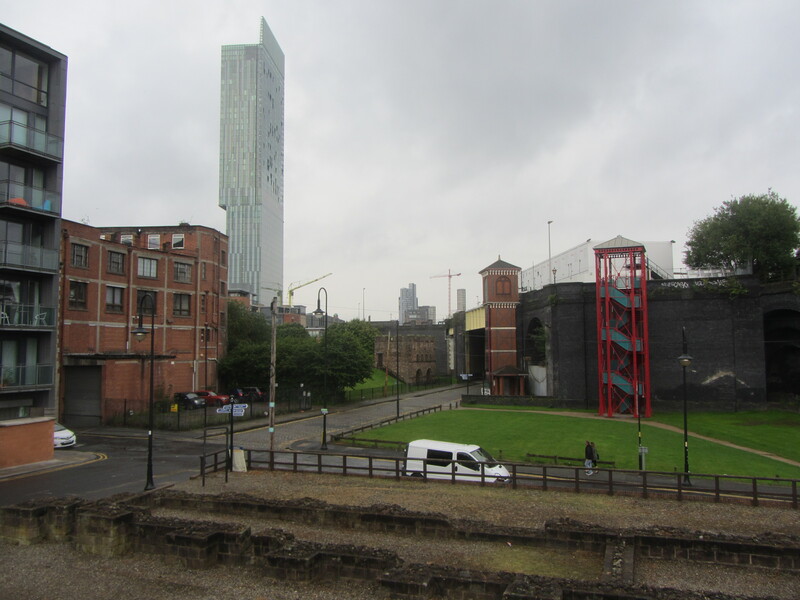 Contrast between old and new Manchester: the hideous Beetham Tower on the left and Roman ruins in the foreground. A mural at the Museum of Science and Industry. Our trip only spanned a Sunday and a bank holiday, so we missed seeing the inside of the hugely impressive Central Library and the 19th-century Portico Library. 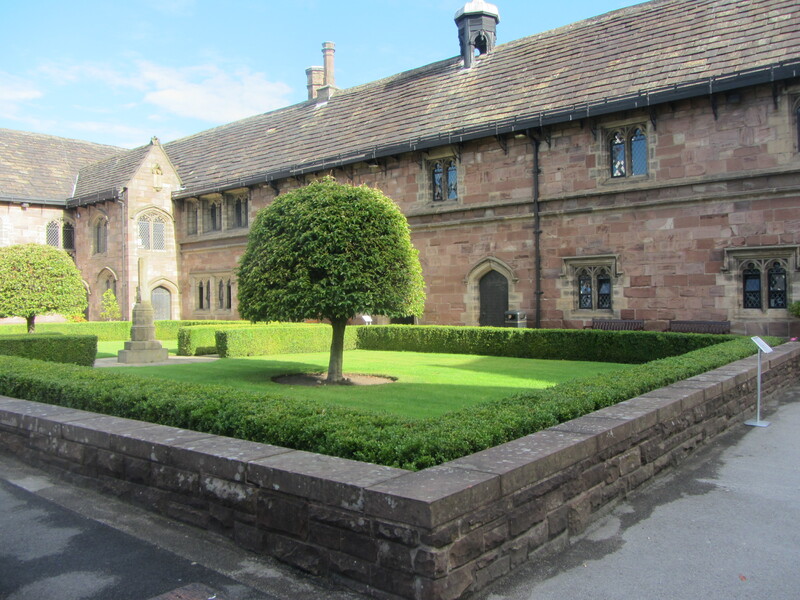 On Tuesday morning, though, we had just enough time before our train back to stop into Chetham’s Library. 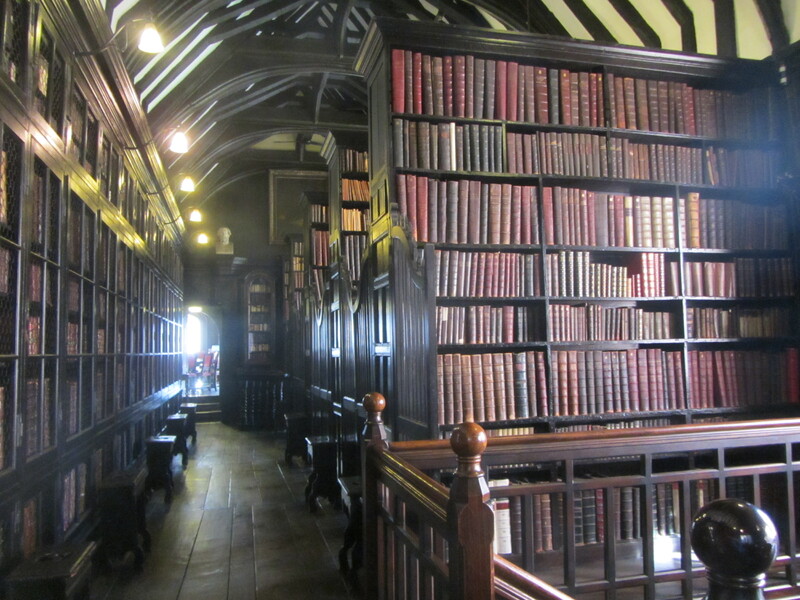 It’s a beautiful old library with rank after rank of leather-bound books sheltering amidst dark wood and mullioned windows. I love being in these kinds of places. They smell divine, and you can imagine holing up in a corner and reading all day, with the atmosphere beaming all kinds of lofty thoughts into your brain. We had the place to ourselves on this sunny morning and sat for a while in the bright alcove where Marx and Engels studied. Apart from The Communist Manifesto, my reading on this trip was largely unrelated: My Salinger Year by Joanna Rakoff, a delightful literary memoir (review coming later this month); Number 11 by Jonathan Coe, a funny and mildly disturbing state-of-England and coming-of-age novel (releases November 11th); and The Mountain Can Wait by Sarah Leipciger, an atmospheric family novel set in the forests of Canada. What have been some of your recent literary destinations? Do you like to read books related to the place you’re going, or do you choose your holiday reading at random?